The Ed and Gwen Cole STEM Building is scheduled to be completed before the Fall of 2018 semester. This 86,736 square feet facility will be a home to makerspaces and research labs that support areas of study in physics, engineering, astronomy, computer science, information technology, and other STEM fields. The 84th Texas Legislature granted SFA a tuition revenue bond funding for this new facility. Ed and his wife, the late Gwen Cole, have supported a number of SFA endeavors, including the Cole Art Center and the Cole Concert Hall. 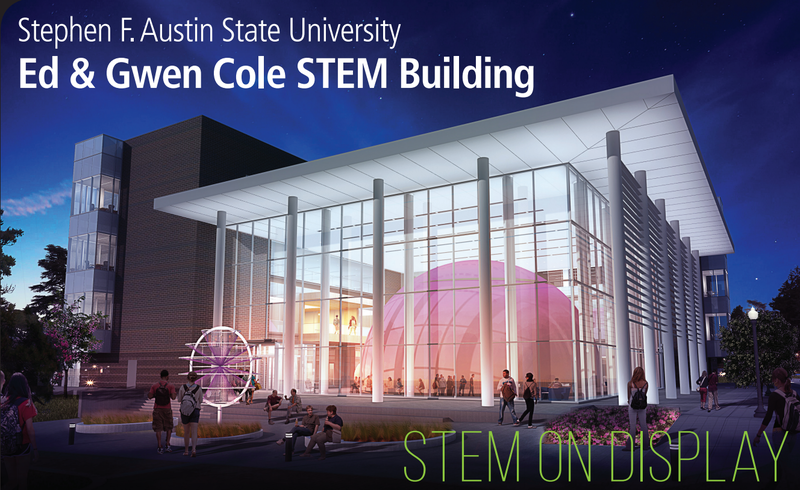 Located across the street from the existing science facility, the new STEM building will house the Department of Physics, Engineering, and Astronomy, the Department of Computer Science, a new SFA planetarium with a 52-foot dome, and makerspaces, which are areas that allow students to collaborate and create prototypes or other manufactured works. The facility also will feature a machine shop, research laboratories, multipurpose labs, computer labs, collaborative classrooms and a terrace equipped with telescopes.